What are you planning to cook this weekend? Do you write a meal plan for the following week and try to prepare things at the weekend? I don't always have our meals for the whole week planned out but I do try to make at least two recipes at the weekend that can cater for 2 or 3 meals throughout the week. I love a casserole or a curry recipe because they are easy to make as a big batch and can often be served with different sides, or frozen and kept for future meals. Thai is one of my favourite cuisines because of it's fresh, light flavours, and subtle spice. 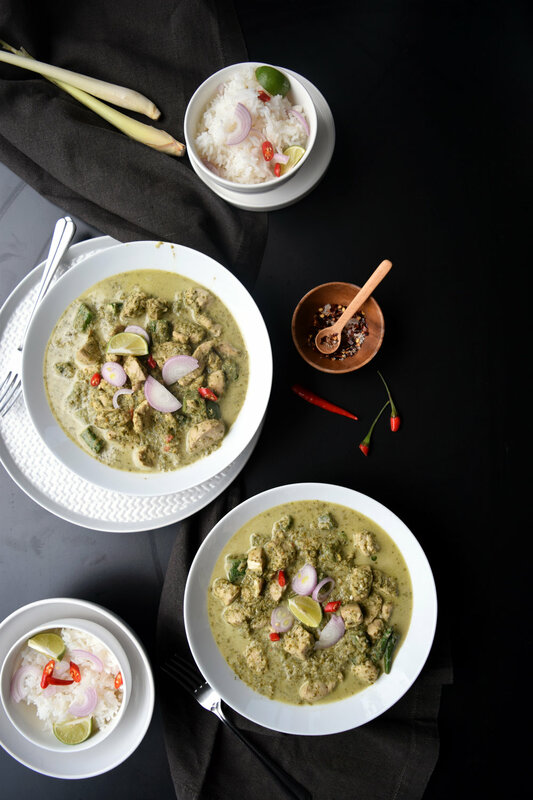 This is my take on a Thai green curry, I don't make it too spicy and it is a favourite with the whole family. Place all the curry paste ingredients into a food processor and blitz for approximately 5 minutes, until a thick paste has formed. Tip: bash the lemongrass against the edge of a work surface or table to loosen the tough outer layers. Remove the tough layers and ends, and only use the softer inner section. Heat the coconut oil in a medium-sized frying pan and fry the chicken until it is coloured on all sides. Add the curry paste, stir well to coat all the chicken and continue to cook for 3 - 4 minutes until the aromas start to be released from the curry paste. Add the chicken stock, bring to a simmer and allow to simmer for 15 minutes until the chicken is cooked. Add the baby corn and cook for a further 5 minutes until almost tender. Add the coconut milk* soy sauce and fish sauce to the pan. Allow to cook for a further couple of minutes. Serve with some steamed or coconut rice. * Depending on how much of the stock liquid is remaining you may not want to add the whole 200ml of coconut milk. ** Sometimes I substitute the corn for okra.